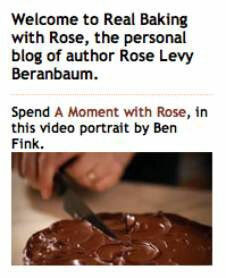 Baker Rose Levy Beranbaum’s blog, Real Baking with Rose Levy Beranbaum, uses the elements of a typical blog — and a few more bells and whistles as well. 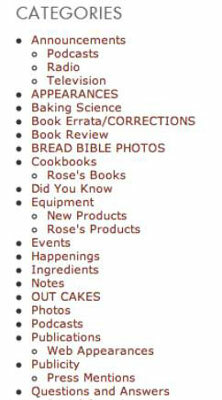 Credit: Courtesy of Rose Levy Beranbaum, author of The Cake Bible (William Morrow). Most blogs — no matter what topic they cover — look quite similar because the elements of one blog are common to all blogs. Rose’s is no exception. Branding/logo header: A header at the top of the blog displays the name of the blog, often including a logo or other visual element. This header is visible on every page of the blog, thereby identifying the blog even to a visitor who visits one of the interior pages without first going to the home page. 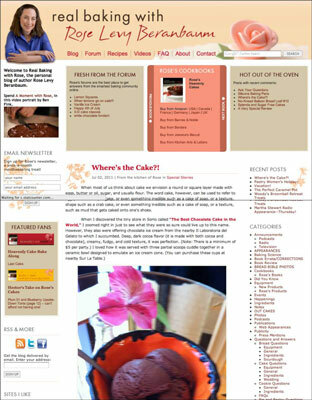 The header contains the name of the blog, a photo of Rose, and the blog’s navigation — the links to the different parts of her site. Most recent posts: On most blogs, the most recent post appears at the top of the blog’s home page. While you scroll down the home page, you see the next most recent post, and the next most recent post, and so on. New posts are typically at the top, making it easy to find the latest, freshest information when you visit. The number of posts displayed on the first page depends on the blog’s style. Some blog home pages are organized by category and show the most recent posts in each of the categories featured. Some display the full text of a post, whereas others show only an introduction, requiring readers to click to read the entire post. To read older posts, you can visit the archives. The date and time the post was published. The name of the post’s author. On blogs that have multiple authors, the visitor may find this info especially valuable. The number of comments on the post. A link to the permalink page, usually labeled Permalink. Sometimes, you can both read and write comments on the permalink page. The category in which the blogger has placed the post. In this example, the category of the top post is Special Stories. Other links to bells and whistles unique to the blog, such as the links to Send to a Friend (which allows you to quickly e-mail the post to a friend) or Print. 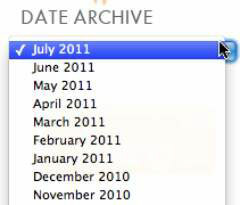 Date-based archives: Nearly every blog archives a post when the blogger publishes that post, both by date and by category. In the sidebar of a blog, you can usually access both archive methods. Here is the date-based archives of Rose’s blog, broken down by month. Date-based archives can also show weeks and years. Categorized archives: By sorting each post into a category at the time that she publishes it, Rose creates an archive organized by subject, making it easy for you to find the posts that most interest you. Clicking a category link displays only the posts in that subject area, organized in reverse chronological order. Blogroll: A blogroll is a list of other blogs that the blogger finds interesting or useful. By including the blogs and websites that Rose likes to read on her blog, she can direct her readers to other interesting websites . And who knows? Those sites may return the favor, sending their visitors to her site. Although fewer sites include blogrolls now than in the early days of blogging, they are still a great way for bloggers to support one another and send new readers their direction. Information about the author: Because blogs can be so personal, sometimes you want to know more about who’s writing them. Many bloggers know that their readers are curious, and those bloggers put together short bios and other information for readers. Bloggers sometimes display this information in the sidebar or link to it. RSS feed link: Readers can use RSS, or Really Simple Syndication, to subscribe to your blog by using a newsreader, such as Google Reader. After a reader subscribes via RSS, he or she can read the latest updates via the newsreader instead of visiting your blog. So, your readers don’t have to visit your blog several times a day to see whether you’ve updated it. 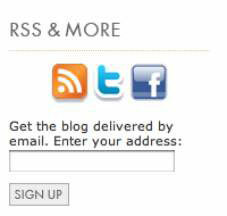 A blog often includes an RSS link (identified by a small orange icon) near the bottom of the sidebar.